Global warming is changing the adventure-travel industry. Sure, climate change has had an adverse effect on activities like coral-reef diving and polar-bear watching. But there are many more stunning things tourists can do and see, thanks to the earth's changing landscape. From springtime hikes in Greenland and on eastern Tibetan trails, which had been covered in snow until summer, to increased sheep sightings in the mountains of Montana, new adventures are emerging. "The reality is that there are more opportunities for travelers to disembark," says Jorge Rodriguez, a marketing manager for Cruceros Australis, which operates cruises from the southern tip of South America. "It's just easier to get to places." And while Antarctica is no quick commute for even the most experienced travelers, it's more accessible than ever. For example Antarctic Dreams, which runs cruises to the bottom of the world, is offering a 14-day expedition in January, instead of its usual 11-day trip, so that its vessel can venture into the Polar Circle. 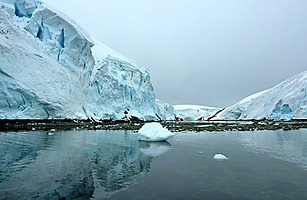 Travelers will cross the narrow Lemaire Channel, known for its breathtaking cliffs, into the heart of Antarctica. Besides gawking at glaciers, you'll spot plenty of wildlife, like leopard seals and the snowy sheathbill, Antarctica's only permanently land-based bird. In 2010, a massive ice wall in Antarctica, which for years had been an obstacle to whale watchers, receded. To the delight of Troy Glennon, founder of Seattle-based Go South Adventures, it recently revealed a shallow channel full of feeding humpbacks. With the wall gone, says Glennon, his group's inflatable boats got within 10 yd. (9 m) of the whales. "They were so close to us, it was ridiculous," he says. "Everyone's heart was swelling." Yes, global warming creates amazing moments. But Glennon and other adventure operators get a bit defensive when discussing climate change's impact on their business. They want you to know, often before you even bring it up, that they're in no way rooting for global warming. "We have a love-hate relationship with climate change," says Glennon. "It gives you access to places unseen and places unforeseen. But the loss of biodiversity, the loss of species  therein lies the hate." Yes, there's a lot to loathe about climate change. But if adventurers sip a little champagne after reaching Antarctica, it's O.K. to cheer. They're adapting to a changing world. Read about the return of Happy Feet, the lost penguin, to Antarctica.